I’ll miss them. You will, too. And with the wrap of this season, reality has sunk in that some of our favorites will move on. Cue the Vitamin C, it’s graduation time. And this crop of seniors saw some stuff. They endured but did not define one of the worst stretches in Pac-12 hoops there’s ever been. By way of historical context I have none. But anecdotally can you tell me I’m wrong? These seniors saw the winner of their conference not play in the NCAA tournament. The Pac-12 was bad. But they won’t be defined by this period of ineptitude. They’ll be defined by the fight we saw and the resilience we cheered. As a slew of fantastic writers boasted of their favorite seniors’ careers (all below), I was reminded that we’re not always fans for the wins and losses. We’re drawn to the human components of this game, the universal truths that we all struggle in an effort to succeed. Which is why it was so rewarding to see EJ Singler in his first Big Dance. And Solomon Hill lead down the home stretch. And see Brock Motum score 79 points in his final three games. And see the career transformation of Larry Drew II. And Joe Burton play the role of cultural ambassador. Maybe they didn’t win any titles and reached just a single Elite 8 collectively, but they were the seniors of our teams and sometimes that’s about all we need to be a fan. LaQuinton Ross got open and that point guard lauded for his playmaking ability found the pistol hot wing. Onions ensued in a play Grant Jerrett said he’d wear the blame for. All screens are switched, that one was not. It became central to the post game dialogue, a dissection of the biggest shot yet made in this tournament. In that unfortunate moment of miscommunication, Grant Jerrett remained on ball. But to point a finger at Grant is to dismiss the mal-execution of a second half’s transition defense. It’s to dismiss the unfortunate lack of offensive execution in the game’s third quarter. It’s to ignore the great fortune of the Ross jumper. But there’s only one shining moment. And for nine straight points, Solomon Hill would not retire. Hell for four years he built for games like this and when he found his team facing their biggest deficit of the game, he carried them. With just a quarter of game in a career to be revered as All-Time remaining, “my man” – as Sean Miller once put it – was not ready to leave. The senior from Los Angeles, the senior of the Miller-era, the senior who played every role the program needed, our senior, scored nine straight points. He might go, but not quietly. Neither would Mark Lyons. This young man, he of every possible storyline, was not about to hang up the Arizona #2 jersey he adorned for one triumphant season of basketball. Albeit brief, the young man from Schenectady, NY was about as Wildcat as they get. Disregard the position you thought he would, could or should play. He played like hell, he played like March, he scored 73-points. And as it appeared his hand was going to be forced to hang that top up, there he was. As we’d seen across 34 previous games – from the unforgettable in Patric Young’s face to the forgettable inside Pauley – our rent-a-point and his own Onions were streaking to the basket, drawing Ross’ contact, and allowing our hearts to soar with hope and our minds to wander to far away places like Atlanta. And for two coaches with the history they share and the respect they hold and the friendship they maintain, what did all that mean? With the three dropped and the heave intercepted and the buzzer buzzed, Thad Matta and Sean Miller embraced and smiled, understanding that what had just transpired – regardless of which side of the scoreboard you sat on – was special. That their season’s work could lead to a tie ball game with but a handful of ticks remaining in a situation begging to build on the lore of our favorite month. Yeah, they smiled. Helluva game. Thad marches on with his scarlet army. A very good team with some marvelously talented players. Aaron Craft is all the headache they said he’d be and Deshaun Thomas is all the beast anyone can handle. And their role players? Well if you’re OK calling a 6’8″ slashing and shooting sixth man named LaQuinton Ross a “role player” then I’m satisfied in telling you that Ohio State’s role players are fantastic. Sean, on the other hand, will console his Wildcats and himself. He may have smiled court side with his old pal but inside he hurts – I certainly do. Because that’s the last we’ll see of that senior who did score nine straight; and that guard who drew the contact; and everything that Kevin Parrom brought to Tucson. That’s it for him and those three. The others will learn from the experience and some day be able to draw upon the magnitude of a tremendous Sweet Sixteen and make plays in the mold of their departed teammates. But there is only one shining moment. There’s a sound reason they call this thing madness. It’s the natural byproduct of 67 games to crown one team. We celebrate a solitary moment, the one we says shines because it’s the moment in which all of these moments collide into something special. And when it doesn’t happen that way, when someone else captures their own version of the shine, sometimes we forget all that was so special about getting to that point. Like when the season was debuted in front of a packed McKale, the 1988 team honored and the vaunted freshmen unveiled. Like first tip against Charleston Southern when the promise of perhaps capturing that shining moment was about as green as it could possibly be. Like that first taste of vulnerability as the Clemson Tigers gave the Wildcats their best shot. And then the Cats swung right back, showing the kind of toughness requisite to special seasons. And Florida. And Miami. And Nick’s block. And Colorado. Of course Pac-12 play left something to be desired heading to Vegas looking worse for the wear. And then they were found and whether he touched the ball or not Sean Miller loudly and expensively reminded his team that they were exactly that: A team. That he had their back and they his. That individually they weren’t going to capture any moments but that the team would. Which brings us back to a dribbling Aaron Craft awaiting a screen from his sixth man following yet another dramatic and fervent Wildcat comeback. The kind we’d become accustomed to in this confusing, exhilarating, shining season. There may be just one shining moment, because not all of them can be shiny. But I sure enjoyed all the others. BB: Arizona vs. Belmont. Goliath vs. David. It’s become the chic pick. Nine of twelve CBS experts have picked it. The President picked it. Gottlieb, Davis, and others made such a selection. This afternoon, inside Energy Solutions Arena in Salt Lake City, Utah, David will be introduced to Goliath. The fans lingering from earlier games and the fans who have arrived early for later games will cheer loudly for David. Amongst all of the 6 vs. 11 and 5 vs. 12 match ups, this is the only one that features power conference vs. mid-major (we can ignore 5 UNLV vs. 12 Cal). 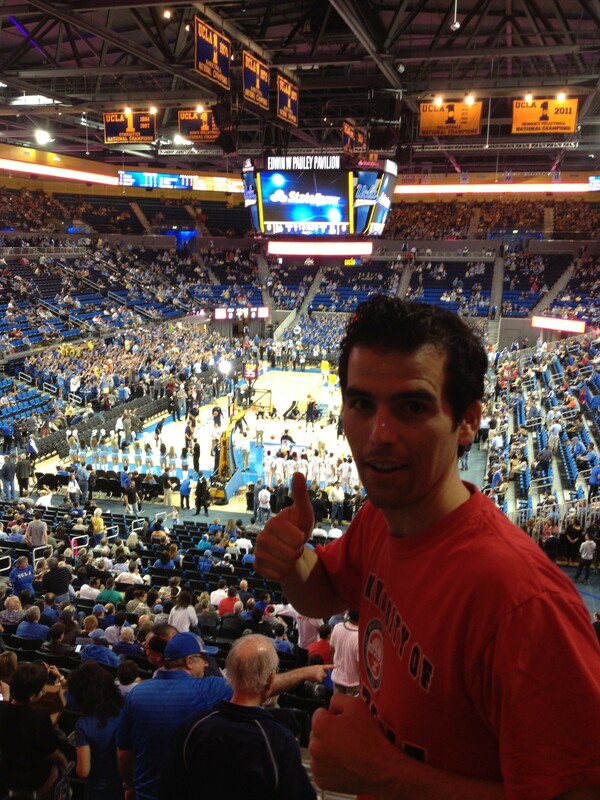 And for such, the world thinks the Belmont Bruins will upset the Arizona Wildcats. They’ll tell you that Arizona yields a tremendous amount of three-pointers; that their perimeter defense has disappeared as they give up those threes at a 36% clip. They’ll remind you that they’ve closed the season with a less than stellar 9-7 record (the same record the 1997 Arizona Wildcats closed their regular season with) including an abysmal loss to USC in which they allowed the Trojans to shoot greater than 60% afield. Undoubtedly someone will bring up Mark Lyons’ shot selection and the lack of depth at the guard position. Someone’s going to call the freshmen a disappointment and yet another will mention that Arizona has not beaten a Bruin this season. And these “outside the box thinkers?” They’ll cite Ian Clark’s dagger-like precision from deep. Did you know this kid drops threes easier than it is to see through a pair of LuLu Lemon leggings? He connects at a 46% clip from deep and at a 54% clip overall. He’s an efficient scorer: 4th nationally in eFG% at 67% which is a higher eFG% than Derrick Williams’ 65% in 2011. Yes, Ian Clark out-efficients even Arizona’s #23. And as a team, those same thinkers will expand, the Bruins make threes. They shoot 40% of their shots from there and make 38% of them. “How’s that match up with that porous Wildcat perimeter?” they’ll laud. Stylistically, it might appear, Belmont was built to upset these Wildcats. These Bruins are small. Their largest contributor is 6’7 240lbs Trevor Noack. Trevor, who basically runs the five for the Bruins, is roughly the same size as Arizona’s starting three, Solomon Hill (6’7” 220lbs). Arizona’s five is 7’ 260lbs. In the business, we call that a mismatch. The Cats, of course, roll out three others bigger than Trevor. They also have Nick Johnson, currently playing the roll of antidote to opposing facilitators. The last two players Johnson has defended (Spencer Dinwiddie and Larry Drew II) combined to shoot just 4-17. No doubt Mr. Clark is eager to meet him. Or the most recent incarnation of Arizona’s defense which has allowed ASU, Colorado, and UCLA to shoot 30% from out there. What’s more about the three-point conversation is that while Belmont takes 40% of their shots from out there – obviously a significant portion of their offense – the Wildcats limit opponents to just 30% of their offense from deep. The Bruins shoot ’em, the ‘Cats limit them. And on the reverse side of that coin, the Wildcats are no three-point shooting slouches themselves. They take 38% of their shots from there and make 36% of them. Not. Too. Shabby. Especially considering these Bruins (who do force turnovers at a high rate which can pose a problem for the TO-prone Cats) yield 37% of their opponents’ offense beyond the arc. 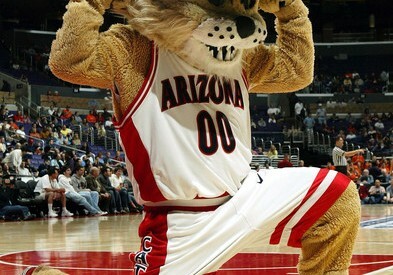 That, my friends, would seem to play directly into Wildcats paws. Additionally these Wildcats can rebound whereas Belmont…not so much. They’ve got the 217th best OR% and yield – defensively – the 262nd highest OR%. Arizona, with its size and propensity to board, will have their fill of second chance opportunities. Possessions, my friends, will win basketball games. Especially considering Arizona scores about 1.13 points on each of them (compared to Belmont’s defense which yields about 0.94ppp). Ultimately, this is nothing more than a chic pick. Arizona is the better team. They’re bigger, faster, and stronger. Belmont is intriguing and no doubt good, they garnered a better seed than 20% of the dancing Pac. But they’re just that, David. Arizona is Goliath, swatting aside the flung rock intended to drop them (this is more than a metaphor, by the way; Belmont shots are blocked at an 11.5% rate, 34th worst in the country). None of which, of course, is to dismiss the magnitude of any game in this cherished tournament. No at all. Arizona will be approaching this game with the respect it deserves. The hype, however, has muddled the facts; a fair conclusion when all eyes are on the opportunity to steal a few bucks from one’s cube mate in the office challenge. But I’d say look elsewhere to steal a win. Not this Arizona team against this Belmont squad. Not in Salt Lake. Not when “my man…he’s never coming back here” is in play. Which is to say one should not underestimate the power of the career finality staring down Parrom, Hill, and Lyons. Some Goliath will fall today. A David in some arena will sling a rock that strikes him ‘tween the eyes, dropping the bigger opponent in shocking and wild fashion. Brad Hill has been a Wildcat fan and close friend since the beginning of time and contributes to PacHoops always. As fans we don’t remember career averages, point totals, assist to turnover ratios, or even records. Over time, what really stands out in our memory are the players. Of course some of the best players to come through the U of A had great numbers worthy of memory, but some of the most memorable players didn’t have great numbers. Did you know that Eugene Edgerson averaged less than 5 points a game during his career? Probably not. Do you remember Gene’s afro, knee pads, and the energy he brought into every minute he played? Definitely. Kevin Parrom is a memorable player. His numbers don’t jump off the stat sheet, but they are solid—he is quietly shooting 41% from behind the arc this year. However, it’s not the numbers that make Kevin Parrom a memorable Wildcat. Fans will remember Kevin Parrom for his toughness on (and off) the court, his courage and perseverance, and the undeniable impact he had on every game he played. 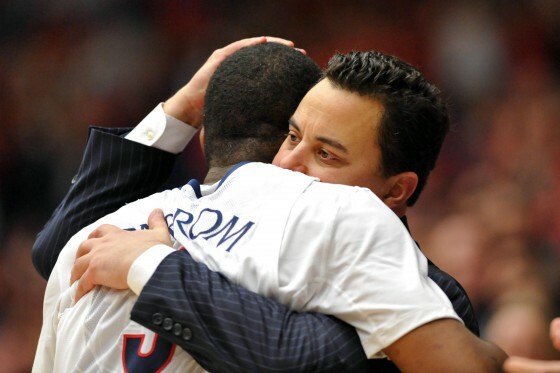 Kevin Parrom will always be remembered for announcing the beginning of the Sean Miller era of Arizona Basketball. Fans have come to expect Miller’s teams to be typified by hard nosed, gritty, and defensive-minded basketball players. Kevin Parrom announced that style of play on January 23, 2010. On that date, Wildcat fans will remember Parrom racing down the court to stop the Sun Devil’s Ty Abbot from making an easy dunk and igniting a raucous Wells Fargo Arena crowd. Kevin leapt up, reached for the ball, and fouled Ty Abbot—hard. But fans also admired Parrom for his courage and perseverance. His junior season has been well documented: in one year he lost his grandmother and mother to cancer, was sidelined by a gunshot wound, and then just when he was getting back to full strength broke his foot. Fans’ hearts and support poured out to this kid, and it showed. When he entered a game for the first time after coming back from the shooting, the crowd stood and cheered as loudly as they had for any victory. 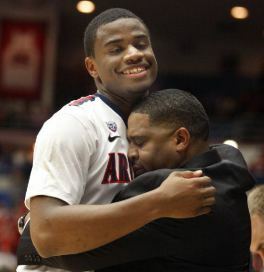 When Parrom was taken out of the game after 18 minutes, six points, four rebounds, and two assists Sean Miller hugged him like you hug your children. It was a moment as indelible as any in the collective memory of Wildcat fans. My dad told me that one Tucson afternoon a couple weeks ago he had no plans to go to the game against WSU, but after reading an article in SI about Parrom, he said to himself, “I have to go support this guy!” My dad went, Kevin Parrom hit 5 three-point buckets—that’s what fans remember. I couldn’t quite give this one an un-biased spin so I asked my buddy Brad to craft this here tourney preview. Full disclosure, he’s 110% Wildcat. Not too long ago, Arizona was projected as the top seed in the West region. Arizona stumbled to the finish line and enters the tournament as a 6 seed, having split their last 10 games. However, this is still a team that started 14-0 and knocked off Florida–the best team in the country. Arizona has also played some of its best basketball over the last 4 games and seems to have patched up its shoddy three point defense. The question for Arizona, and its fans, is which team will show up: the team that started 14-0 and played inspired defense over the last two weeks; or the team that found a way to lose to USC? The experts are counting on the latter, as Belmont is the chicest upset bid in the entire draw (9 of 12 CBS Experts pick Belmont, as did The President). Only one way to find out: let’s dance! 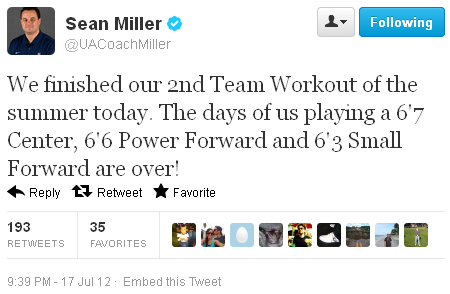 Why I like them: Sean Miller. Sean Miller coached teams do well in tournaments: he has coached in the NCAA Tournament 5 times and been to the second weekend 3 times. More importantly Arizona is loaded with talent. The team sports a group of freshman that comprised a top 5 recruiting class and is collectively playing their best basketball of the season right now. Additionally, Arizona starts three seniors who all have aspirations of playing professional basketball. The most encouraging reason to like the Wildcats is that in the past three games, they’ve held opponents to 12-39 (30 percent) from behind the arc–six points lower than their season average 36 percent. Bottom line: Arizona has the talent, the coach, the experience and the pedigree to beat any team on any given night. Why I don’t like them: They allowed teams to shoot threes at a 36 percent clip this year; that’s good for 276 best in the country. (Belmont has two senior guards that shoot over 40 percent from three, and one–Ian Clark–is the best 3 point shooter in the nation). 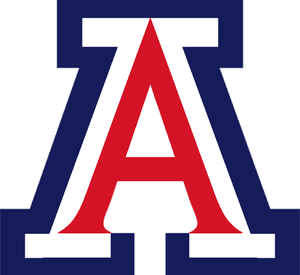 After starting 14-0, Arizona only managed to beat one team (Colorado) in the top half of the Pac-12 conference the rest of the way. To make matters worse, reliable Senior’s Solomon Hill and Mark Lyons shot the three at a less than 30 percent clip the last ten games of the season; while playmaker Nick Johnson disappeared for the month of February and most of March. Bottom line: Arizona has played inconsistently and shown an ability at times to lose to any team on any given night. Poetic Justice: Kevin Parrom endured a tragic and well documented year that saw him lose his grandmother and mother to cancer and then endure recovering from a gun shot wound. He chose not to redshirt just so he could keep his mind on basketball and now he leads his team on a special tournament run. Mark Lyons came here for one season: to win. And so he does and Sean Miller’s first recruiting class leaves their mark on the program. Best possible scenario: Arizona’s defense shows up and their size and athleticism overwhelms Belmont. 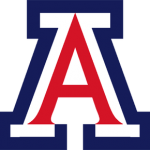 In a second round tossup Mark Lyons is lights out from behind the arc, and Arizona prevails in a close game against a talented New Mexico squad. In the Sweet 16 Arizona gets some help from Iowa State who shoots lights out from three in the first two rounds, knocks off Ohio State, and then goes cold against the Wildcats. Finally, Arizona’s length gives Kelly Olynyk fits in the Elite 8, and Grant Jerrett plays the game of his life, as the Wildcats head to the Final Four. Sean Miller’s first. Ultimately, the Wildcats run out of steam in the national semi-finals but, man, what a run. One of our favorite things about collegiate athletics is its fleeting immediacy. The players we cheer for, those who don our colors, are there for a predetermined and brief period. 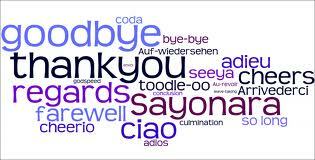 We enjoy their services for, at most, four seasons and then its on to their next venture. It’s quick, gone in what feels like a flash, and we’re then left with a new crop of talents to cheer, critique, and enjoy a new group. But it’s this brevity that magnifies the relationship. We know all too well of its finality that we’re further drawn to irrational levels of fandom. I love it. And now the seniors have now wrapped up their final home games. They will never play on their home court again. For this, I’m sad. Because these are the guys we’ve followed since before they got to school and watched improve and watched succeed and watched fail and watched grow. They’ve embodied a lifecycle we appreciate and now is the time to usher them on and out. For such, I’ve reached out to some of my favorite writers, bloggers, and fans in an effort to try and capture the feelings of this time of year. Both the bitter and the sweet. It’s a good crop we’re saying farewell to and a terrific group who have pieced together some remarkable, exciting, and fun careers. And it’s not a new feeling. Since Sean Miller arrived in Tucson, expectations were tempered and then quickly elevated as he made an improbable run into the 2011 Elite Eight and that was awesome. I went to Anaheim to see Jamelle Horne’s three rim out. I walked out of that place with hope and excitement – amidst some hollow gut – for the future of this program. Of course last year let some of the air out; but then the recruiting class and Lyons and the promise of veterans Solomon Hill and Kevin Parrom, and we were back. We all know this story and the subsequent 29 games that have transpired since. Expectations and hype are gone. Reality arrived. Of late, the air has once again been let out. But here’s the thing. I see an Arizona team that has struggled with urgency. A group that’s allowed itself to play from behind too often and now that’s burning them. Their early success in such situations, through the lead of calm veterans, perhaps earning them a level of comfort that grew too comfortably. Urgency has been the issue. Saturday marks the beginning of the new season. The final act in what should prove to be a three part act: 14-0, 9-6, ?. 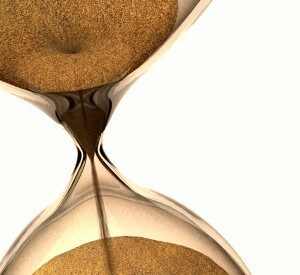 This third act will not be lacking in urgency because there is nothing but urgency left. On Saturday we will celebrate the careers of the first, four-year Wildcats of the Sean Miller era. They’ve endured the bumps and bruises of a budding program and will be just the second and third four-year seniors to participate only twice in the NCAA tournament (Kyle Fogg was the first). The theatrics of Senior Day should serve as a glaring reminder that this whole thing is finite. It doesn’t go on forever, you don’t get to connect over Patric Young or dismiss Chase Tapley or freeze up in LA and Colorado forever. Urgency is the issue that has been addressed but not handled and now it’s going to be forced. Solomon: You lose and it’s over. Kevin: You lose and it’s over. Mark: You lose and it’s over. I know it means something to the fans, the legacy a player leaves behind, and this is the month when legacies are cemented. That Horne jumper I mentioned before? Had that thing fallen, it’s a whole different memory for the four-year contributor who always seemed to leave a lot to be desired. And I imagine it means a lot to them. After all, they came to Arizona to compete for things they might not have otherwise competed for at another school. They wanted to finish with the best 18-game record. They want to run through a tournament in Staples (now the MGM). They want to hear their school’s name called on a Sunday. They want to win their last six games. At this juncture, the legacy is beginning to spiral; taking a turn towards “what happened” and off of the road to “special.” Because something special is what we knew Arizona had – what that team knows they have – when this season started. A dyanmic front court with size and length and skill. A gutsy and tried play maker delivering arrogance to a group perhaps lacking just that. A spring loaded off guard capable of defensive havoc and highlight reel finishes. A veteran pair of point-forwards who have laid the red carpet for those to come. But special can’t happen until the urgency of these finite moments is realized, embraced, and attacked. The Wildcats have been dropped into the deep end. Will the sink? Or will they swim? And with such comes a fan base leaving something to be desired in noise production and timeliness, a perceived arrogance marinated in the aforementioned lore. But it’s deserved. With regards to the timeliness, I will give a moderate hall pass as I was grossly reminded of Los Angeles’ infamous traffic and only wish it upon a handful of contemporaries. But traffic was never an issue in arriving to Los Angeles. Definitely no traffic issues getting there. Of slight concern was my aggression towards a piano bar 29th birthday party Friday night but ultimately that never proved a deterrent to departure but did ensure my ibuprofen consumption. Roommate Tim and I were out the door and into the Red Dragon by 5:45am and at Spencer’s door by 5:57am. Spencer would sleep for the better part of the next 393 miles. 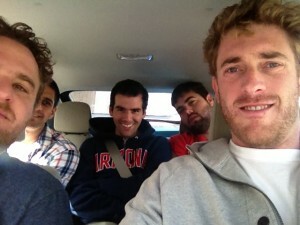 We stopped briefly in Palo Alto to acquire our fourth companion, Justin, and breakfast at Starbucks. Then onward and southward. 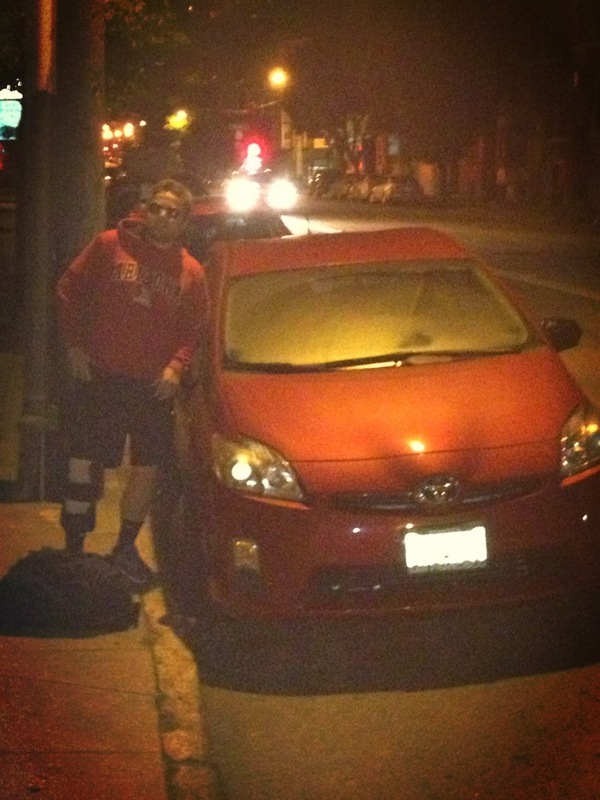 It was during this part of the trip that we learned Justin lives exactly one Prius tank of gas away from Venice Beach. We rocked the hell out of Songza playlists like “’90s Crowd Pleasing Hits,” “100 Worst Songs,” and “’90s One-hit Wonders,” and other songs of requisite road trip nature. We had an adult conversation about religion with references to sociology and general human nature while Spencer slept. We dissected the hell out of Arizona basketball – past, present, and future – and concluded that Johnny Dawkins is on the hottest seat in the Pac, what realistic expectations are for Beavers and Cougars, and whether or not we’d ever want to own a Ranch (the consensus was ownership without having to deal with horses). Spencer never snored. In-n-Out was acquired just outside of Los Angeles – a road trip requirement – with the 80-degree weather being met with mixed reviews and begging the question of how any of us ever played High School baseball double headers in July in 104-degree Tucson summer heat wearing cotton socks, polyester pants and sliders, a jock strap, a cotton shirt, a mesh jersey and a hat. For the record, I loved the 80-degree heat. 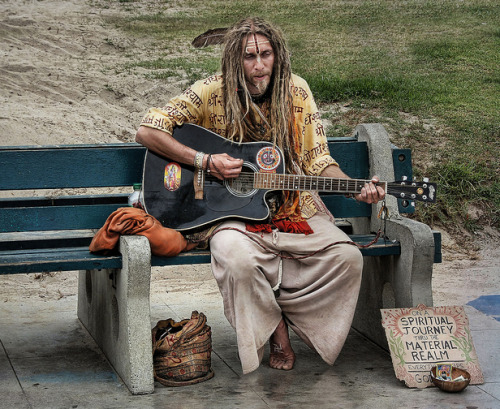 Arrival at the hotel was familiar as we quickly learned that Venice Beach significantly parallels The Haight. Arrival in Westwood would prove less simple. Following back-to-back cabbies shaking us off like a 3-0 slider, we sat down to recuperate from the rejection at the local drinking establishment and conjure up a cab plan. Fortunately our waitress was kind enough to call us a cab. Unfortunately for her she’d attended Arizona State. We tipped her for the cab effort and gave our condolences on her adolescent decision. At a cost of $40 covering just 6.6 surface street miles and 40 more minutes of asinine conversation, we arrived at the predetermined libation house, Barney’s Beanery, adorned in red as I explained to a young Wildcat (sub-six years old, not at the bar) why I’d just encouraged him and his family to Bear Down. Paying it forward I believe they call it. Drinks ensued with nary a word of trash exchanged as both Cats and Bruins alike lamented Ryan Kelly’s miss-less return (although I will fully admit it embodied everything I love about the drama of sport) amongst the pre-game anxieties. Then we headed to Pauley. I was intrigued to see the redesigned and modernized pavilion. Much had been made of the school’s investment in the old stadium (The Bruin Road Show) but perhaps the fellow behind me in line – who also noted I would be having to change my shirt upon entry to which I informed him of his probable disinterest in seeing me shirtless – said it best, “You can’t do a $100 million overhaul of a $5 million building.” So very LA to give a facelift to an aging wonder while ignoring innate flaws and failing to address intimacy. The 50+ year-old, on-campus gem was cleaned up, given a contemporary look and feel with a professional viewing experience. Aesthetically, it worked. But the stadium seating still begins a fair distance from court-side and the acoustics won’t quite aid an already peaceful audience. Which is the exact point my friend in line was making: Pauley was never a viewer’s dream, but at least now it looked nice. Because whatever home court advantage you can conjure up has always come from what I’ve already mentioned: the banners, the history, the mystique and aura of the greatest program in the history of college basketball. So once inside the stadium, a fan of the sport, I had to look up and take in what no other school has accomplished. At halftime what other choice did I have but to applaud the 1972 NCAA Champion Bruins? Regardless my fan allegiances, bravo to a collection of athletes piecing together an undefeated thirty game season. But then it was game time and the ball was tipped (VANDROSS IS COMING!!!!) and in seventeen brief seconds Mark Lyons had gotten to the rack for two and it was on. Well Arizona would hold a lead for just 15 more seconds in this contest. 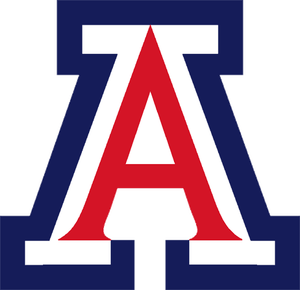 The Cats teased and toyed with a modest Arizona fan backing but ultimately didn’t have the defensive presence or ball maintenance (18 turnovers) to defeat a sound and beautifully point-guarded Bruins team. I left that remodel perhaps more impressed with Drew2 than upset with Mark Lyons’ decision making, Solomon Hill’s passive game, Nick Johnson’s shooting, Nick Johnson’s ball handling, Brandon Ashley’s disappearance, and Kaleb Tarczewski’s hands. OK, clearly I was a touch upset about a few things but just trust me when I say I was impressed with Drew2. It was senior night and he played like he was home. And, at risk of jumping too far down Sappy Street, isn’t that what college is all about? He made kid decisions as a kid, quitting on his Tar Heel team and bolting without facing the music. And now he’s led the Bruins through what really had the foundation of becoming a tumultuous season. I mean really led and grew up. I admire that. But the Cats gave it one last push. They showed that tardy fight that helped them to 14-0 with key victories over Florida and San Diego State. With 24-seconds remaining and the ball, Miller called timeout and I took a seat back in my chair; lightly rocking with a nod to my head and a pounding in my chest. I clapped hard twice because what the hell else do I have to contribute besides noise and the ball was in-bounded to Lyons. The crowd rose to its collective feet. Here came the high screen. Into the lane went Lyons. More than half the clock gone. The crowd was quiet-ish no longer. And the game ended and the view obstructing railing no longer mattered. The banners waved a smidgen and the seats became a little less comfortable. Dammit. It was a long walk back to Barney’s where we exhausted the house’s Fireball supply with one modest round for eight ailing Wildcats. The game was dissected extensively back at our hotel as Cast Away played in the background. Or maybe it was the foreground as Wilson was the closest thing to sports any of us could handle. 3…What the hell is he doing? 2…That cape is really small. 1…This better be goo—HOLY BALLS DID HE JUST DO A FLATFOOTED, STANDING BACKFLIP?!?!? Indeed tiny Batman had just done a flatfooted, standing backflip as the place erupted. Dancer A tried his hand at redemption but to no avail. Because you can’t beat a flatfooted, standing backflip in a dance battle. And you can’t beat a road trip with your best friends. You really cannot. For the second time in less than a month I’d walked out of an opposing building wearing defeat in the form of an upset. Don’t care. I’m heading to Las Vegas to take my chances again. And amongst all the madness of the road trip we began conjuring plans to get our asses to Ann Arbor next fall for the front-end of the Arizona-Michigan home-and-home. For the charge home we’d picked up one additional pal, Faisal, and some hangovers. Nothing some ’90s hits couldn’t cure. We discussed more nonsensical hypotheticals, what the TJ McConnell effect could be, and how we were going to make it back to LA for Arizona’s trip to the Sweet Sixteen. Being a fan is great. 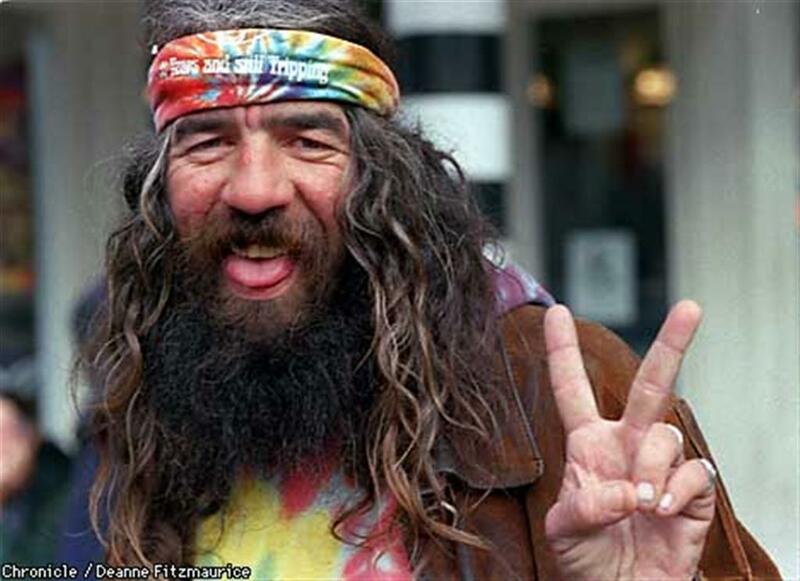 And Spencer didn’t sleep a wink. Beaten but not broken. But cramped.